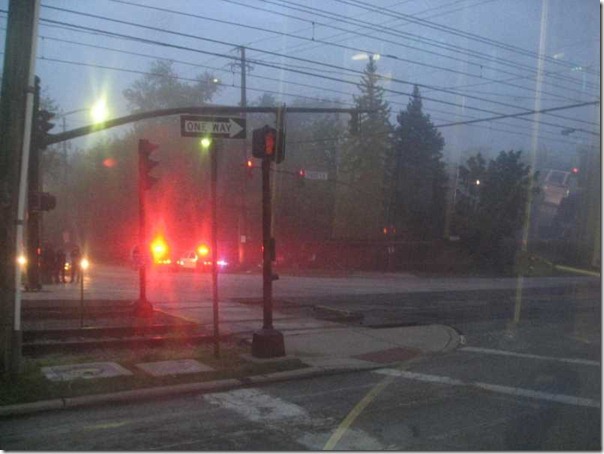 I got up at 4:30am so I could leave my house by 5am and catch the Rapid at Green and Shaker. That is the most eastern spot to catch the Cleveland RTA train. On Sunday, the 5:40am is the earliest train. It gets you to Tower City at 6:03am (a little less than a mile from the start of the race). 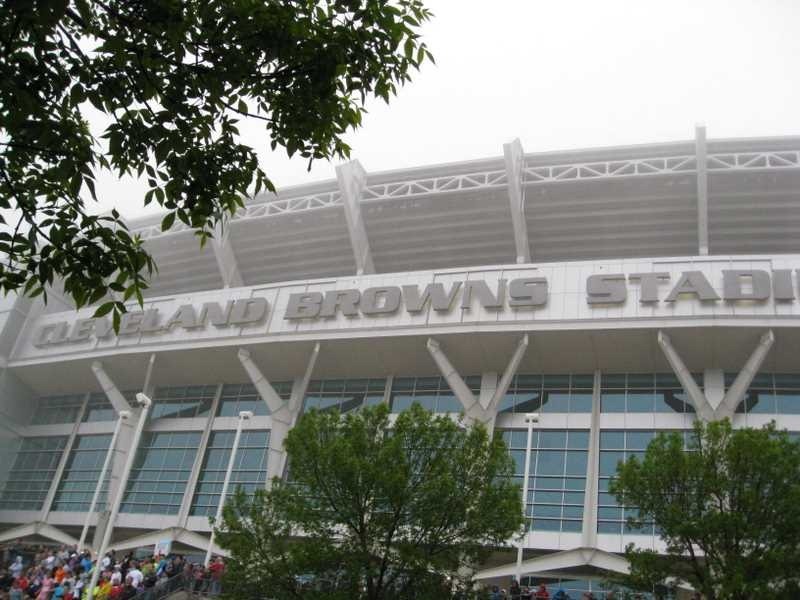 The continuing train to the Browns Stadium doesn’t run until 9am on Sunday. I arrived at the Rapid Station without incident. I didn’t see one car during my commute until I approached the station. About 8 other cars pulled in. All but one carried runners. I was dressed to spectate and it was easy to strike up conversation with the runners. 5:40am came and went. 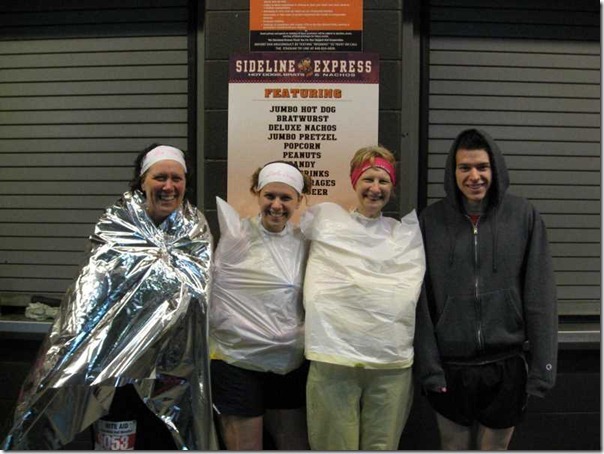 Then, it was 5:53am and a couple of the runners got in their car and headed downtown. Right after that a bus pulled up to the station with “GREEN LINE” on it’s sign. We’re taking the bus? We all hurried on. At this point, there were many nervous and running late runners. Apparently, there was a flipped car on the tracks and the train couldn’t get to the station. We asked the bus driver if he was taking us all the way to the stadium or downtown and he didn’t know. He was flying west since there wasn’t really any traffic. We passed the accident. You can’t really tell in this photo since it was still dark, but there were a few emergency vehicles and a bit further down, a mangled car upside down on the tracks. The driver ended up taking us to Van Aken. He honked his horn to get the attention of an approaching blue line train and we all hopped on. About 6:25am, we arrived at Tower City. After purchasing my fare card, I headed to the starting line. The race started and finished near Cleveland Browns Stadium. This was especially nice since the stadium was open for restrooms and cover from the elements. 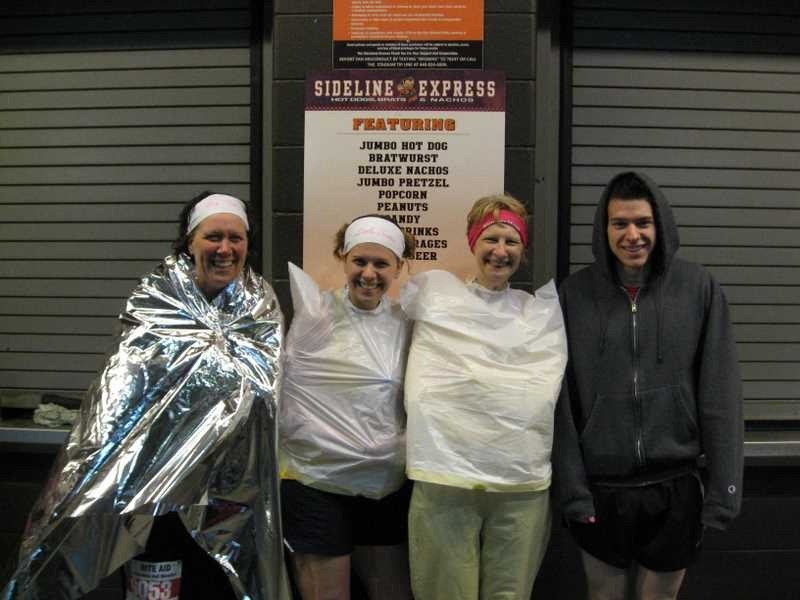 It quickly became clear that I was not going to be able to see my family before the race. I did make it close to the start line in time to hear the national anthem and watch the start of the race. Once the corrals cleared, I met up with the other spectators. After chatting with Maureen, Erin and Frank, I headed to the finish area and they headed to mile 7. All of our family/friends seemed to be doing the half marathon distance. 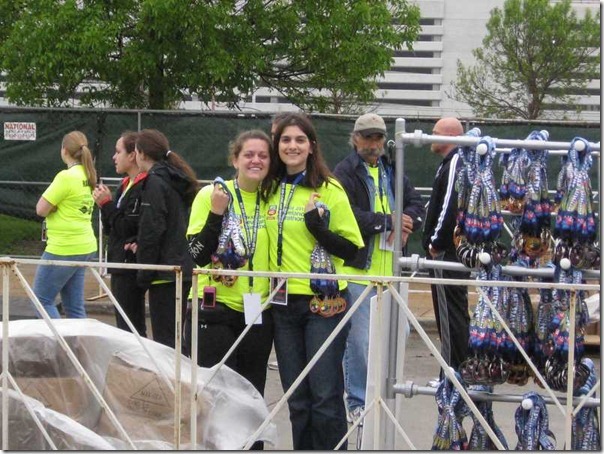 At the finish area, I saw Katie and Alicia. 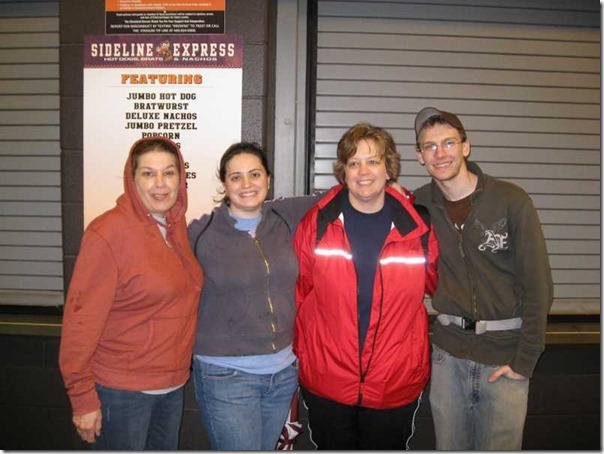 I’ll be meeting up with them later in the week at Fit Bloggin’. They were volunteers who spent a few hours passing out medals. 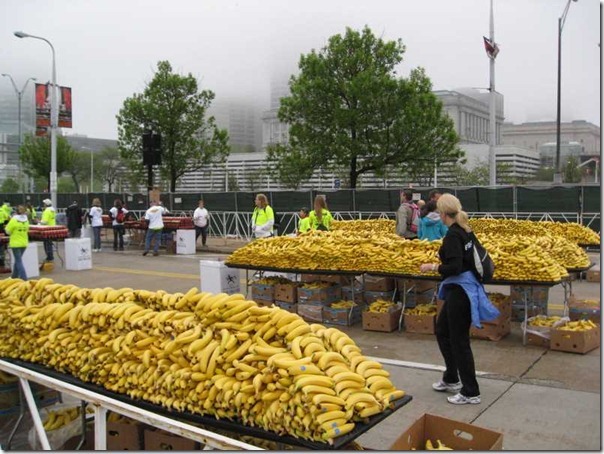 There were also lots of bananas waiting for the runners. It was cold, foggy, drizzly and not the best spectating weather, but the races were fun to watch. I was able to see the finish of the 10K, wheelchair races, 1/2 marathon and full marathon events. I was alerted via text message as runners completed 10K and when they finished. All of the runners that I followed completed the race and many had personal records or met their goals. 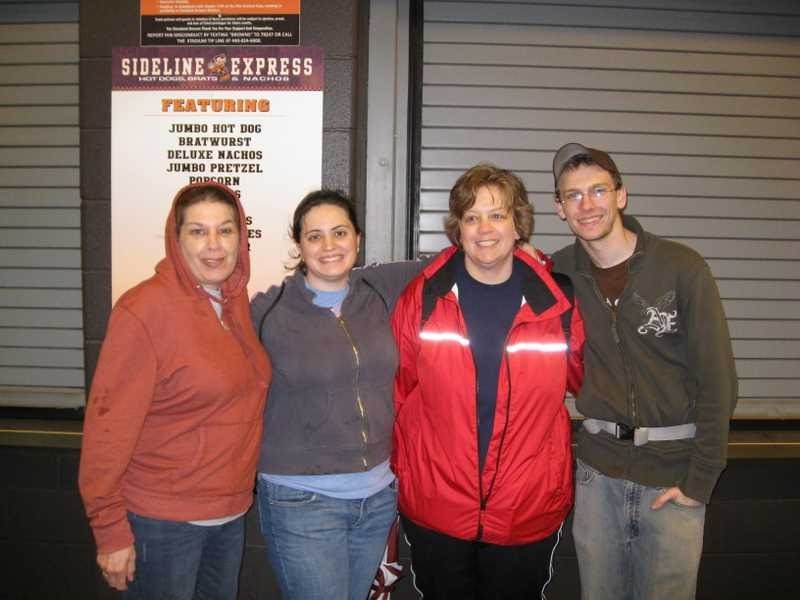 Here are the runners in our group from left to right – Carol, Holly, Mom and Justin. Next up: orthopedic appointment for my knee in the morning.